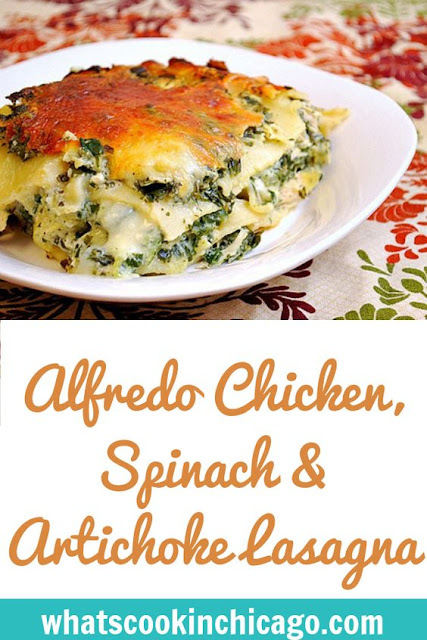 Article first published as Alfredo Chicken, Spinach & Artichoke Lasagna on Blogcritics. It's that time of year where I'm all about comfort food and one of my favorites is a serving of lasagna. There are so many variations on lasagna and the most recent one I made is this Alfredo Chicken, Spinach & Artichoke Lasagna. A spinach artichoke mixture is mixed with creamy alfredo sauce and layered with shredded chicken, mozzarella cheese and noodles. Seriously, what's not to love about that combination?! If you want comfort food, this one will deliver. It's creamy, cheesy and easy to put together! I used gluten free lasagna noodles but of course, you can use your standard lasagna noodles for this recipe. I found the recipe works with either no boil noodles or ones you cook first before layering. Whatever you prefer will do just fine. As for the chicken, you can save yourself some time by using a store bough cooked rotisserie chicken and using just the chicken breasts. Remove the skin and shred the breast meat for the recipe. Otherwise, if you prefer baking up a roast chicken to use for the dish, that will work just as well. When it comes to alfredo sauce, I'd much prefer making it from scratch. However, if you want another time saver, use a store bought jarred alfredo sauce. Maybe add some freshly shredded parmesan to it for a little more cheesy flavor - a little cheese never hurt anyone, right?! I made this in advance and prepped it as a freezer meal (directions included below) which is great for nights you don't have the time to make things from scratch. In doing this in advance, you don't have to bake the lasagna first before freezing - just assemble, cover and freeze. All the baking can be done when it's popped in the oven before you serve. 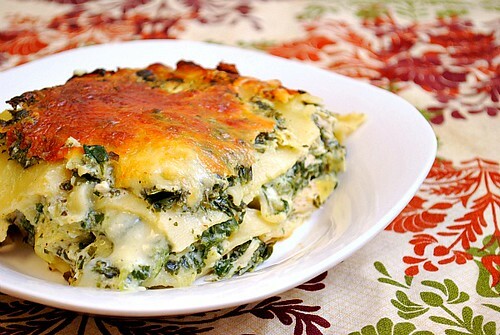 This is a great spin on lasagna using the ever popular spinach artichoke dip as inspiration! Spread 1/4 of the spinach artichoke mixture in the bottom of the prepared baking dish; top with 3 cooked noodles. Sprinkle 3/4 cup mozzarella cheese over noodles. Add 1/2 cup shredded chicken over cheese. Repeat layers 2 more times, ending with artichoke mixture and mozzarella cheese, reserving 1/2 cup of cheese for later. Bake in preheated oven, loosely covered with foil for 40 minutes. Uncover, add remaining 1/2 cup mozzarella cheese, and bake 15 minutes more, or until hot and bubbly. Let stand 10 minutes before cutting. * To make ahead/freezer meal - Prepare the recipe as noted above and assemble the layers in an oven- and freezer-proof baking dish. Cover the lasagna with plastic wrap and again with foil before freezing. There's no need to bake this lasagna before freezing. When you're ready to serve, remove the lasagna from the freezer and defrost. Bake in a preheated 350 degree oven for 45 minutes. Uncover, add remaining 1/2 cup mozzarella cheese, and bake 15 minutes more, or until hot and bubbly. Let stand 10 minutes before cutting. You are definitely after my own heart. I love ALL the ingredients in this recipe. In my fave recipe box this goes! This looks incredible! But WAY too high in calories for me to justify except over the holidays -- so I've got this one on my calendar to make for the family the day after Christmas.